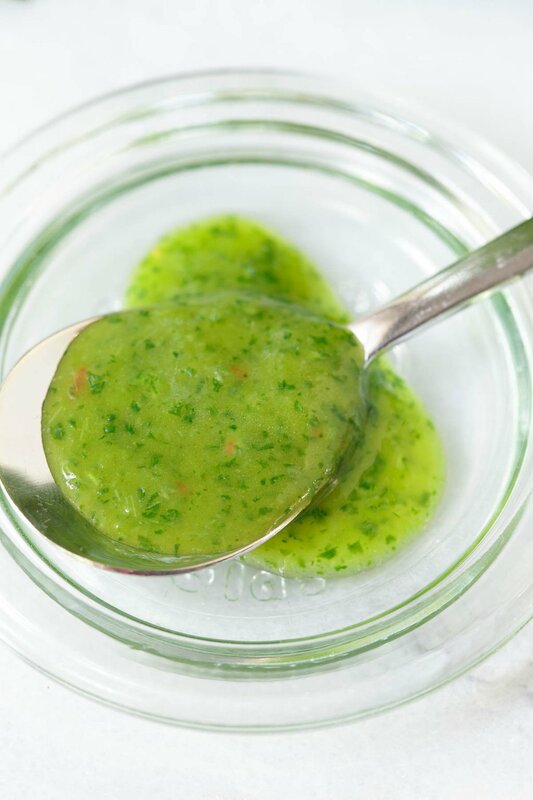 Fresh and vibrant this Lemongrass Cilantro Salad Dressing is delicious on salads, grilled chicken, shrimp, salmon, pork and so much else! They say “the apple doesn’t fall far from the tree” and that’s certainly true in this family when it comes to enjoying good food. We all love to eat, whether it’s sweet or savory, healthy or… not so much. And, just like me, my daughter Cait and daughter-in-law Lindsay, love discovering delicious new recipes to share when the family’s together. Recently, during a get-together at Cait’s lake house, Lindsay made a fabulous salad for dinner one evening. I especially loved the fresh, vibrant cilantro dressing and couldn’t get it out of my mind. Upon returning home, I recreated the wonderful dressing, but with an Asian twist and a new name – Lemongrass Cilantro Salad Dressing. The Asian inspiration was easy. I simply added some chopped lemongrass and ginger along with a splash of chili-garlic sauce. Rice vinegar in lieu of regular white vinegar was the other change I made to the original recipe. The result? Another fresh, super flavorful dressing to brighten up all sorts of salads – and lots of other things too! This is one of those super-easy, throw-it-all-in-the-blender recipes that takes less than 5 minutes from start to finish. It will last for 4-5 days in the refrigerator, so I like to make plenty, and love having it stashed in the fridge to pizzazz up all kinds of meals. It’s wonderful drizzled over grilled chicken, shrimp, salmon, and pork tenderloin. It transforms corn on the cob to something close to nirvana and makes a wonderful appetizer spooned over goat cheese and served with crackers or crostini. 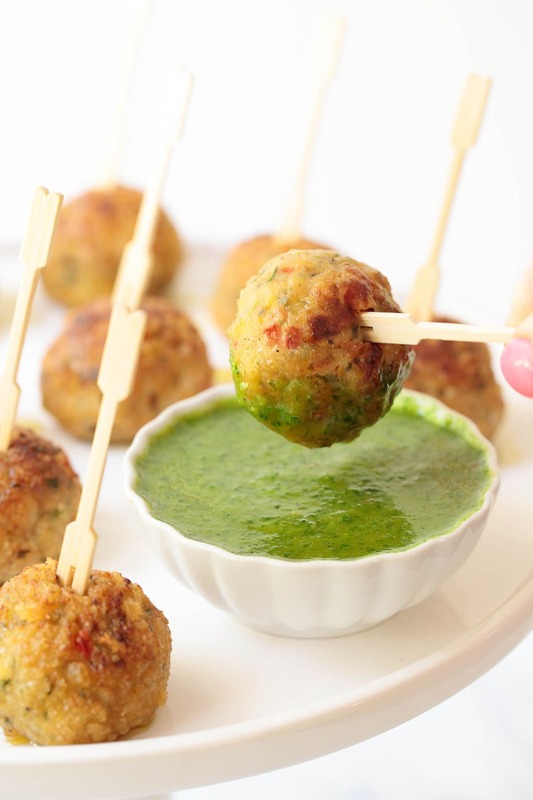 I’ve also served it as a dipping sauce with a platter of Asian Chicken Meatballs (recipe coming!) – a crazy delicious appetizer or a great light snack. Pick up a large bunch of cilantro next time you’re at the grocery store. You’ll also want to put fresh ginger and lemongrass on your list. 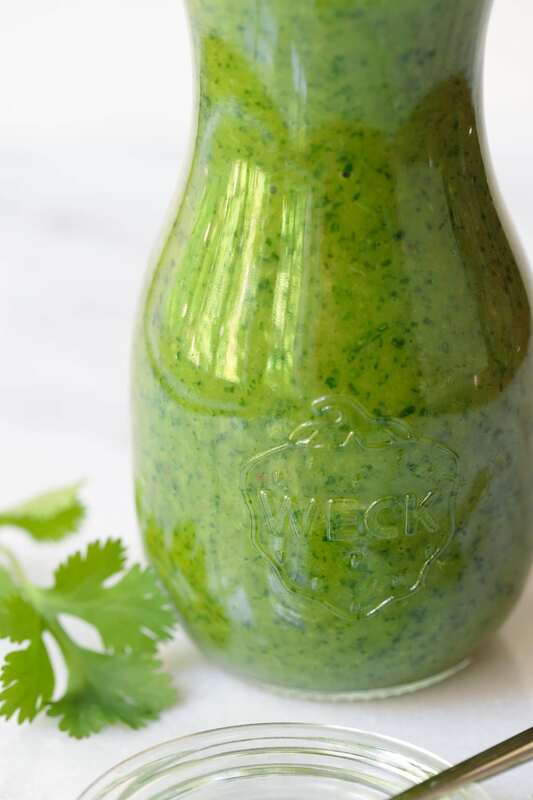 You probably have everything else you need to make this Lemongrass Cilantro Salad Dressing. You’ll be happy you did, and so will anyone else who graces your table. Extra-virgin olive oil can become bitter if blended or processed too much. Cook’s Illustrated explains that this phenomenon is caused by a high percentage of polyphenols (a type of molecular compound) in extra virgin olive oil. EVOO is actually the only oil that has such a high level of polyphenols. When these molecular compounds are broken down, in the blending process, they create a bitter taste. That’s a simple explanation of a complex chemical reaction, but that’s why I changed the original recipe a bit. I like to add olive oil at the very end and either whisk it in by hand or just use the blender briefly, to avoid this problem. Cilantro bunches can vary from store to store in size. I like to use a bunch for this recipe that’s around 4 ounces in weight. Cilantro stems have lots of flavor! Unlike parsley stems, which can be bitter, cilantro stems are delicious and tend to have even more flavor than the leaves. Lemongrass is becoming more and more easily available. Some stores carry it in the little plastic packets with the fresh herbs. Other stores have a special area for it. If you have trouble finding lemongrass, look for lemongrass paste. You will find lemongrass paste in the produce section of the grocery store. It comes in a tube and can be stored in the freezer. Just remove as much as you need and then pop it back in the freezer. It will last for months frozen. Ginger is also available in the same area of the grocery store, as a paste. I keep one in my freezer for those days when I want to try a recipe with ginger, but don’t have any fresh ginger on hand. This dressing will keep well in the refrigerator for 4-5 days. Shake well before using. You’ll find this dressing is wonderful on just about any salad. 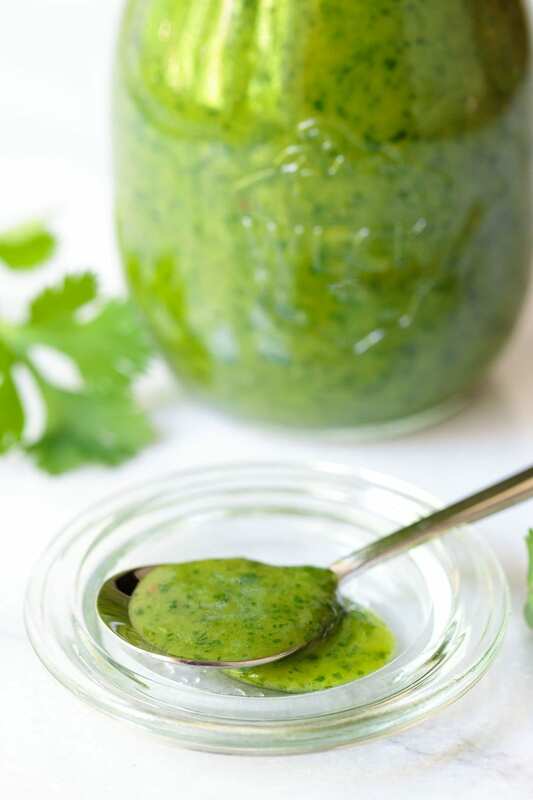 You can also use it on grilled or pan-seared chicken, shrimp, salmon or pork, corn on the cob, tomatoes, grilled veggies… And there’s a fabulous recipe coming up for Lemongrass Chicken Meatballs which are a perfect pairing with this Lemongrass Cilantro Salad Dressing. Add more water if you want the dressing thinner, less if you want it thicker. Chili-garlic sauce is available at most grocers that have an Asian section. It comes in a small jar/bottle and will last a long time (months) in the refrigerator. It adds just a bit of spicy pizzazz to this delicious dressing. Add more or less to your taste. If you’re in the market for a blender, I LOVE my KitchenAid Proline Blender. It’s way more than a blender, similar to a Vitamix, but sturdier and is easier to clean. It effortlessly blends smoothies, nut milks, soups, sauces… It would make a wonderful gift option for someone who enjoys cooking. Don’t care for cilantro? You could use the same amount of basil for an equally delicious dressing. 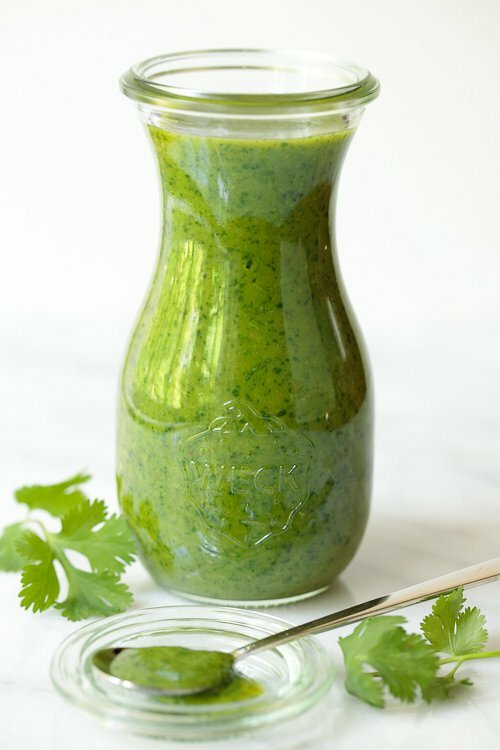 Fresh and vibrant, this Lemongrass Cilantro Salad Dressing is delicious on salads, grilled chicken, shrimp, salmon, pork and so much else! 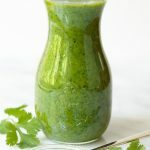 Combine cilantro, rice vinegar, lemongrass, ginger, chili-garlic sauce, salt and water in a blender or food processor container and blend until chunky-smooth. Add olive oil and blend just until incorporated, 20-30 seconds. Do not over blend after adding olive oil. For further instruction and tips see Café Tips in post (above). I cannot find any fresh lemongrass to use in the recipe, only the paste. Can you tell me how much I should use? Hi Judy, use the same amount. I love the paste! I keep it in the freezer and just thaw it slightly before using, squeeze out as much as I need and then pop it back in the freezer. Lemongrass is not an ingredient I use on a regular basis but it’s really nice to have it on hand when I do want to use it in a recipe. I bet this smells wonderful and the color is beautiful. 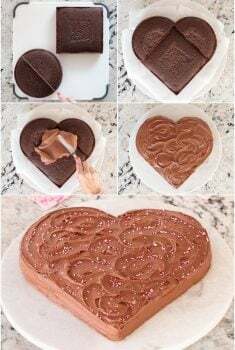 Tried this recipe, loved it. I also added some mint leaves to it. Thanks for the recipe! Thanks for sharing your results, Pragyaso happy you enjoyed this dressing. I love the idea of adding mint! Beautiful, vibrant salad dressing! I know I would love the Asian ‘twist’ you gave it too. It looks so good with those chicken meatballs! You make the most fabulous salad dressings! Love this (and all of them 🙂 Great inspiration. Will be trying this one this week for sure. I love, love trying new salad dressings and this sounds fabulous, Chris!! can you use Dried Lemongrass? Hi Michael, I wouldn’t try dry lemongrass. It just wouldn’t be the same fresh flavor. Please hurry with the meatball recipe, I am drooling all over my shirt. 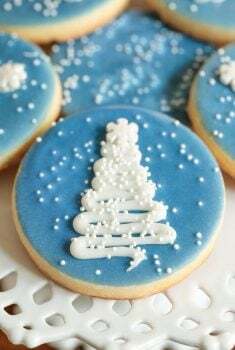 Thanks for so many good recipes. Made your Chicken Shawarma and loved it My wife said it was to spicy so I had some for breakfast today with Greek roasted Taters. Haha, I love it, Wayne! I was planning on posting one other recipe before I did the meatballs but I hate the thought of your shirt being drenched so meatballs next, it is! If using lemongrass paste instead of chopped lemongrass, how much should I use? I didn’t grow any cilantro this year…sighs…the dressing looks good! So gorgeous! I could even smear this dressing on a sandwich to bind it all together. Such a great sauce Chris – and so pretty too! Love this. Love that you offered cilantro bunch size information. Love your creativity. One of my favorite blogs. Please share what size weck jar you used for this recipe. . .